Restaurant promotions can help stir up some business in slower months, during a lull in the day’s business hours, or even when traffic in your restaurant is at its highest. People love discounted or free items and they give diners an incentive to visit you and even choose your establish over another. So, which restaurants have had success with running promotions? We highlight 5 stellar restaurant promotions that you can take cues from in your own business. When you hear the word happy hour, your mind probably goes to discounted beers and spirits, half-priced tapas, and deals on select cocktails. Happy hours in bars and restaurants help to draw in after-work crowds and late night party-goers. But, happy hour doesn’t just have to be for liquor and bar food. Starbucks took the idea of happy hour and ran with it – for coffee and novelty drinks. Starbucks Happy Hour first launched in 2010 with discounted Frappuccinos on specific days. Lines flooded the streets with people waiting for a discounted mocha fix. The uber-popular event left baristas out of breath, so Starbucks decided to revamp the promo by making it more exclusive. And let’s face it, exclusivity is attractive. Today, if you go to happyhour.starbucks.com you’ll find a form waiting to be filled out with your name, email address, and zip code. This signs you up to be a Starbucks Rewards member and allows you to receive updates on news and promotions. Genius, right? Now, they’ve captured tons of email addresses to be used in marketing efforts. Although Starbucks is taking a bit of a revenue cut by offering BOGO pricing on select items, they’re capturing more customer data to be used later on. Pretty great marketing if you ask us. Starbucks is currently running a buy-one-get-one free happy hour promotion just on iced drinks, including iced coffees and lattes, cold brew, and even their iced tea concoctions. This event is perfect for the end of summer. And, of course, they’re not running this promo during the morning caffeine rush. BOGO starts after 3 pm on certain days – making it hard for people to resist that second coffee to reverse their mid-afternoon slump. So, how can you execute on inspiration from Starbucks’ Happy Hour? You may already offer happy hour specials at your restaurant, but try making additional offers more exclusive. Let patrons know that if they sign up for your mailing list, they can unlock more deals and discounts. 55% of consumers receptive to email marketing prefer money-off deals. If you offer hard to resist promotions, diners will be waiting for new deals to hit their inbox so they can dine with you again. Yes, you read that correctly. Domino’s recently introduced their Potholes for Pizza campaign which is helping towns across America pave the way for more perfect pizza. They’re asking consumers to nominate towns who are in dire need of road repair. Then, they’re acting on it by helping fill gaps in the pavement so pizzas don’t get bumped or bruised during delivery. 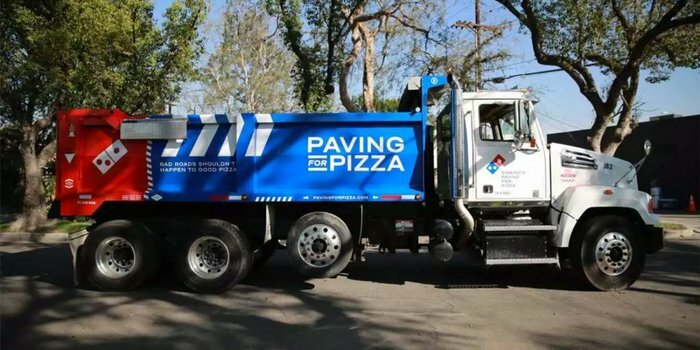 According to a press release, Domino’s is providing grants to selected towns in order to make their roads great again. To date, they’ve already fixed around 200 potholes in four cities. This promotion isn’t monetarily based as far as offering discounts on food items, but it makes Domino’s look really, really good. A pizza chain that cares about your community? The effort and execution they’re putting behind this initiative shows that Domino’s cares about its patrons and their neighborhoods. This gives the restaurant brand a human-like quality that can’t be achieved just by offering coupons. Of course, we don’t expect your restaurant to participate in something to this scale, but you can take cues from Domino’s strategy and apply it to your business. Make a statement in your community, put a face behind your brand, and participate in local charities or other town events. Sponsor local community events and get to know people in your neighborhood. This type of restaurant promotion shows that you care and helps build relationships that can turn into long-time patronage. We’ve all seen those iconic Sonic commercials, the gimmicky bits starring improv comedians that have been serving up laughs since 2002. And although Sonic banks on these funny quips, what they’re really trying to sell is not their jokes, but their current restaurant promotions. 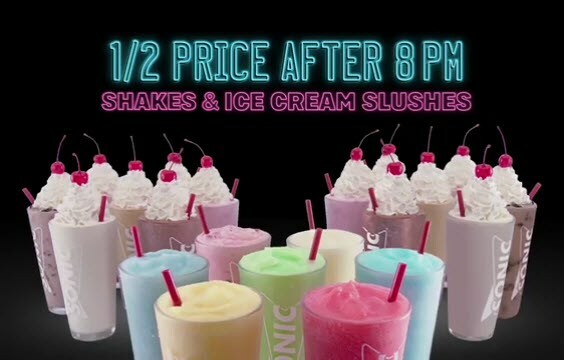 Currently, Sonic is offering a “Sip Your Night Away ‘Til Labor Day” deal that offers half-priced drinks after 8pm. Shakes, floats, and ice cream slushies are all on sale for the remainder of the summer. Similar to Starbucks’ Happy Hour, this sweet deal offers a price-cut on items during a time that probably sees less foot traffic than peak hours. What do we like about it? The relevance. Summer is the time of year that people want to enjoy icy drinks and delicious shakes. Plus, with school dismissed until after Labor Day, families and groups of friends are staying out later than usual to get the most out of the long hours of summer solstice. This is why offering summer-specific deals after 8pm is a huge win. Plus, if you sign up for their mobile app, you can enjoy a free drink or slushie. Test this out in your own restaurant by offering seasonal-specific deals. You can dream up a new seasonal menu and offer discounts on select items during a specified time frame. Since fall is just around the corner, test out some seasonal items at a discount and see how popular they are. After school (3-5pm) or the post-work rush (5-7pm) could be golden opportunities for increasing business through promotions. Once daylight savings time comes around in the beginning of November, you can create a promotion around that. “After Dark Deals” can help inspire hibernating diners to come out for a meal instead of staying put on the couch. I’ve been craving a DQ Blizzard all summer now. Unfortunately, I don’t live in close proximity to a Dairy Queen, but I do see their mouthwatering Blizzard commercials quite often. The mixed ice cream treats are delicious and seemingly unbothered by gravity (if your Blizzard falls to the ground when you turn it upside down, there’s some sort of guarantee). Dairy Queen makes one Blizzard, in particular, the star of the show each month with their Blizzard of the Month promotion. 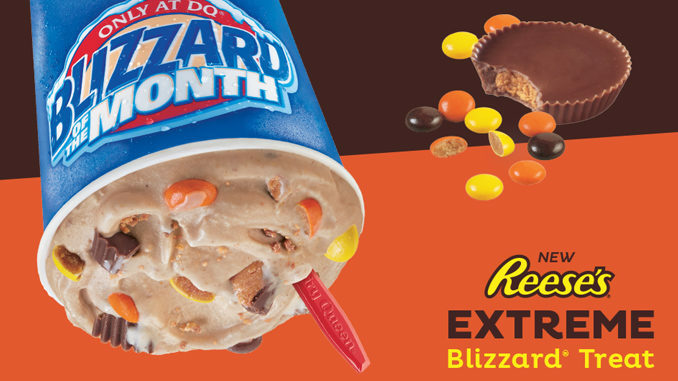 For instance, this month gives special praise to their Reese’s Outrageous Blizzard. You can join the Dairy Queen Blizzard Fan Club (which has over 4 million members, by the way) to enjoy their buy 6 get one Blizzard deal. Although the Blizzard of the Month isn’t specially discounted for the month, we like that Dairy Queen makes a buzz around a new item each month. This makes it exciting for those dedicated Blizzard lovers to see what’s next on the pedestal. Plus, if the Blizzard of the Month catches a hungry person’s eye, they may just make a specific trip to pick one up. When planning your next calendar year, try dedicating each month to a different stand-out item. You can offer discounts around those items for that month, or just promote it heavily on social media to make it hard to resist coming in to try one. When coming up with an item of the month, pay attention to the food-inspired national holidays. September 13th, for example, is National Guacamole Day. Why not just make the whole month of September a celebration of guac? 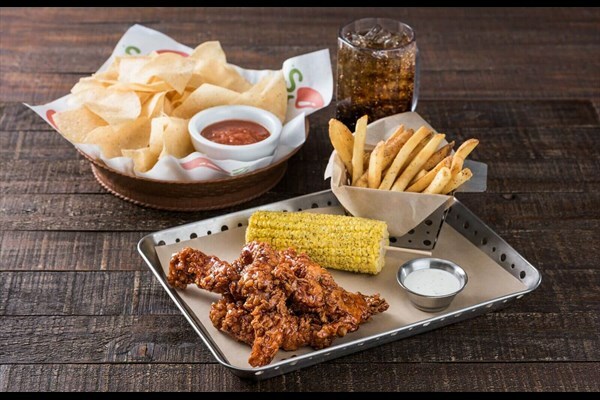 Chili’s, the popular restaurant chain that puts a bit of spice into the casual dining landscape, has a 3 for $10 promotion running that lets diners choose a drink, a starter, and an entree all for one Alexander Hamilton. Of course, the beverage option is non-alcoholic, and entree items are pretty basic, like chicken fingers and a burger. But, for $10, how can anyone really complain? The deal is available for dining in or picking up, which makes it an even better deal that reaches a wider audience. You can adapt this idea to your restaurant menu by choosing certain items that can be combined to make an irresistible deal at a low price point. Different combinations include an appetizer and entree for $15, an alcoholic beverage and an entree for $20, or an appetizer, entree, and dessert for $25. Play around with the menu offerings and price to find what works for you. If you want to put a time constraint on this deal, offer it as a lunch promotion or dinner discount on certain weeknights. Just make sure you’re staying profitable while offering a deal that’s difficult to pass up. Promotions, discounts, and deals are great ways to get new and returning customers in your doors. They’re useful when trying to attract crowds during slower hours, looking to boost business in off-season months, or just to create year-round buzz for your restaurant. Large restaurant chains have the manpower and budget to create attractive and memorable campaigns around their current promotions. Although you may not want to offer a promotion on that big of a scale, you can take inspiration from these restaurant brands and apply them to your own business.